At Paulie’s our definition of a well groomed man is this: to creatively blur the line between a classic cut and a trend. 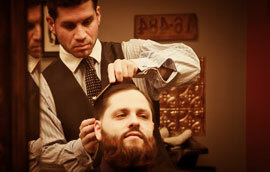 This duality we offer moves men forward and keeps them fresh and in style. Together with your input we’ll find a haircut for you that promotes confidence of presence and nothing is more masculine than that. Men tend to forget about themselves. Treat yourself. Our ideology dates back to the 1920s when a dapper gentleman sought out a close, clean shave in an inviting and masculine atmosphere, the latter of which we have fully recreated for you. 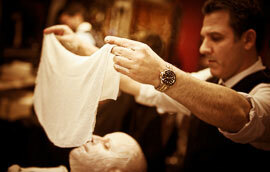 Hand in hand with the Hot Towel Shave. Very relaxing. After your Hot Towel Shave we will incorporate a facial applying Stephen’s Vanishing or Menthol creams. This is a special formulation that effectively soothes, rejuvenates and purifies the skin after shaving. Those creams provide relief from razor burn, ingrown hairs and skin irritations, while replenishing necessary nutrients lost during the shaving process. Applied while administering a relaxing face massage. A very popular service on gentlemen’s wedding day.